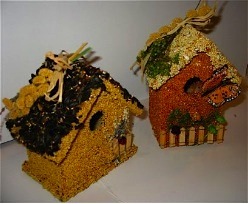 Bed & Breakfast Edible Birdhouse is Back On! Delectable, functional and a totally fun gift, the original Birdie’s Chalet Bed & Breakfast is back for the holiday season! 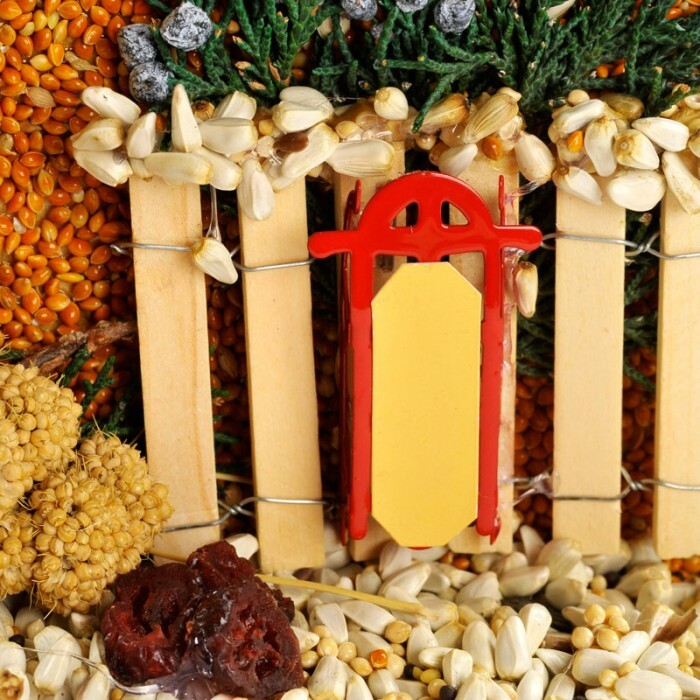 It’s an awesome edible birdhouse with premium seed consisting of songbird’s favorites; black oil sunflower, safflower and millet. A decorative pine cone on top lets you add peanut butter or even spreadable suet for more variety and a calorie-packed winter treat. Festively designed to bring smiles to recipients and birds, the gift keeps on giving well into spring. The 1.5-inch entry accommodates bluebirds, downy woodpeckers, nuthatches, chickadees and many others who’d be happy to call this place home! Once the seed is consumed, the birdhouse may be stained, painted or just left natural to weather over time. A sturdy hook on top lets you easily hang the abode from a quiet branch in the yard. It’ll be hosting a family in no time. 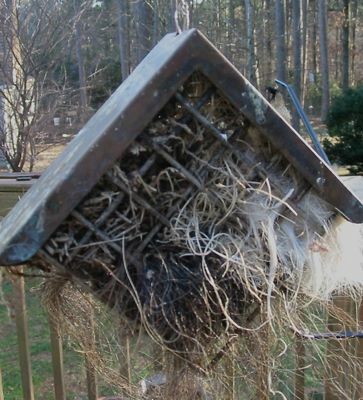 Keep the house up year-round to offer a roosting spot on cold nights. During inclement weather, birds may also seek shelter inside the cozy digs. During rough winter weather, it’s important to remember the resident birds. Food, water and shelter will keep feathered friends around your place through the long cold season. The Chalet is a gift that lasts, for feeding activity now, and for many spring seasons as a useful birdhouse. They may only seem like a “gift type” item, but edible birdhouses actually provide several uses for wild birds. Especially during busy migration times, they make an excellent food source with high quality seed for birds along southern migratory routes. Once the seed’s been picked off, your resident birds will find a cozy roost for cold winter nights. These full size wren houses are well suited for chickadees, titmice and of course local wrens. Some birds may even line their roosts with dried grasses, leaves, or other nest type materials to further insulate themselves from the elements. Locals like bluebirds are more apt to huddle together, retaining body heat for added warmth. Because they’re real wooden structures beneath the seed, these edible houses may be stained or painted to further preserve them. Nesting! Come spring and the busy nesting season, smaller songbirds find these spots the perfect place to nest and raise their young. Complete with sturdy hook for quick hanging, a branch provides an optimal spot for them… unless you have squirrels around the yard! But this is easily remedied with the use of a hanging baffle to foil the pesky critters. So it’s not only a killer gift for any nature enthusiast, an edible birdhouse will serve birds well… throughout the year! Have You Seen Our New Edible Birdhouse? The best one yet, it’s big, colorful, scrumptious, and totally functional… such a great gift idea for the holidays! Decorated with detailed whimsy and premium seed, it’s almost too tough to put this one outside! Wild birds will flip for the Bed & Breakfast Chalet… twice over. Once the seed’s gone, the slightly larger entrance offers a great nesting site for most small to medium size backyard birds… even bluebirds. It also provides a cozy shelter or roost during the off-season, when nesting isn’t happening. But you want it to last as a feeder? Most importantly, keep away from squirrels, they’ll have a field day with any birdseed ornament or edible birdhouse that’s not protected. And rain – that’s a bummer too and will take it’s toll on ruining seed prematurely. Placing the bird feeder/birdhouse in a sheltered area, or using a weather guard or squirrel baffle is highly recommended for use as a feeder. Seed will last much longer to feed more birds. Does it really look that? Absolutely, and with every detail. 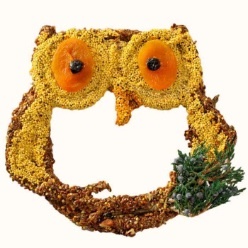 Festive seed treats and edible birdhouses are spectacular gifts for any gardening buff, nature enthusiast, or birding fanatic-like us. Any holiday leftovers already have a chosen spot in our yard… guaranteed! Big Seed Ornaments and the Edible Birdhouse are Back! With cooler weather heading our way, the natural foods birds forage for will become more scarce. Insect populations are dying off, and the once vivid flowers seed heads’ of late summer and fall have pretty much been picked over. Now’s the time when birds (and squirrels) are caching food in tree cavities and crevices for winter feeding. Woodpeckers, chickadees and titmice are famous for this behavior. Some birds will even steal others caches! It’s definitely the time to gear up in the bird feeding department if you happen to partake. Suet always offers a calorie-packed meal for most backyard birds. 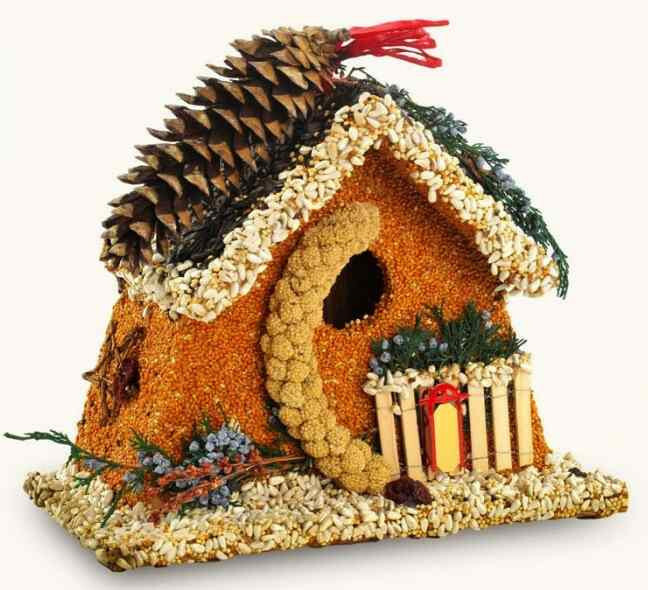 But in the fun department, big seed ornaments and the wren casita edible birdhouse are back! Coated with premium seed, nuts and fruit, these big ornaments are an excellent food source for birds and some even make real houses for nesting and roosting once the seed’s been consumed. 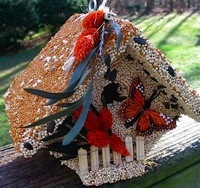 Birdie Cottages are other edible houses that offer a cozy roost for smaller songbirds. In a set of two cottages, there’s one to keep and one to give! 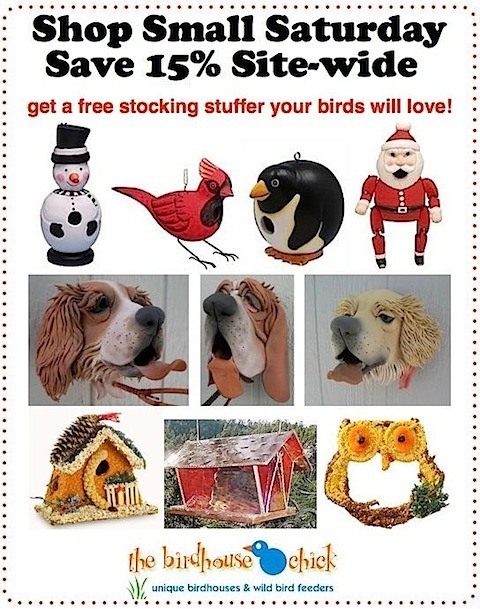 These decorative feeders make for awesome gifts for any nature lover on your list… and the birds will love them too! 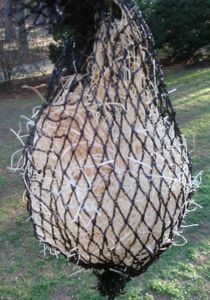 encourage birds to nest in that edible birdhouse after the party’s over! Although it makes an awesome feeder, the All Season’s Wren Casita edible birdhouse is the perfect nest site-for more than just wrens. Some folks have inquired how to re-seed them for extended use as feeders. I suppose peanut butter might work as a good base… but the manufacturer sure isn’t giving away their secret so fast! So just how does one encourage nesting? It’s all about habitat, so start by offering a fresh water source. No fancy-pants birdbath needed, (unless you’d like one in your yard) something as simple as a plant saucer filled with water works great. On the deck, step, rail, tree stump…wherever! Drill three holes in the sides of a plastic one and make a quick hanging bath should ground predators lurk in your yard (cats). Optimal depth is just 2-3 inches for birds to bathe and wade comfortably. If your dish or saucer is deeper, consider a large rock in the center for birds to perch, or lining the bottom with river rock, or a few layers of pebbles. Decorative mosses like Spanish, sphagnum, green sheet moss, raffia, and that dried straw stuff. Pluck some from one of your house plants! Feathers are adored by tree swallows, and bluebirds have been known to add a few here and there as well. Really cheap at a craft store, or any un-dyed feather duster will do-preferably clean. Live anywhere near a horse farm? Horse hair is the best, and we give it away in the spring! The key is to get the materials out before nesting season actually starts. That way birds see it and become familiar, knowing that when it’s time, the goods are right there for the pickins! Avoid placing materials in any birdhouses as avian amigos prefer to do their own decorating! Simply hang from a branch where they’ll see it. Also, don’t pack the vessel too tightly, as you’ll want the materials to dry quickly after a rain shower. Offering nesting materials will absolutely encourage nest building around your yard, and extend the use of that edible birdhouse! Scorching temperatures and lack of rain have left most of the country in the dust-literally. For wildlife, these extended conditions prove to be daunting. It’s difficult to find food and water, and even more critical when raising young. Birds in our yard have actually been taking seed from feeders to feed fledgelings, Cardinals and Thrashers to be exact. Mother Nature’s device of “survival of the fittest” is in full swing this summer. So as far as feeding birds in summer… why wouldn’t you? Food sources are scarce, and supplemental feeding may mean the difference between life or death for some baby birds. 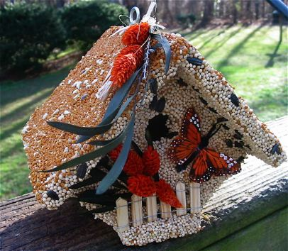 This edible birdhouse provides seeds for lots of resident songbirds. If protected from the elements and squirrels, it should last a while. And even if the seed goes faster than anticipated, you’re left with a real wren house that provides a perfect nesting site for next season. The wooden house beneath the seed may be stained, painted, or left natural. During the “off-season”, the house makes for a great roosting spot too. Appropriately named the “All-Seasons Wren Casita” it makes a fantastic gift for any birder or nature enthusiast… or even for yourself! Be kind to wildlife and offer fresh water if you’re in a drought-stricken area. A shallow bowl of water makes a swell birdbath, even a plant saucer is great. Just keep water fresh and birds will come! So many houses… and so little time! With Valentine’s Day fast approaching, gifts of nature are always a perfect choice for bird-lovers, garden addicts and the like. Hmmmm… Bird house or bird feeder? This groovy Wren Casita is both! A real, full-size wooden wren house is revealed once the premium birdseed has been consumed. Layered with millet, safflower and sunflower, it proves a tasty treat for your avian amigos. Chickadees, finches, and titmice are a few who will flock to this feeder. These unique birdhouses may be painted in a whimsical design, stained, or just left natural to weather over time. The decorative flowers and stems on the Wren Casita may be used by some birds for nest material as well. For use as feeder, just hang this unique birdhouse from a tree limb or hanger in view where you’ll be able to watch the action. As with all bird seed, best results will be obtained when it’s protected from the elements and pesky squirrels. For use as a birdhouse, simply hang the Wren Casita in a secluded part of the yard, or mount to a post or tree trunk approximately six to ten feet from the ground. Surprise your Valentine with an edible birdhouse that will provide a critical nesting site for many seasons to come. Please help house the birds!